2. The drivers in the Hoosier state can choose between about 80 different choices for their passenger vehicle license plate design. Everything from universities to charities are offered as a license plate design choice. Yeah, it's gotten a bit out of hand. So, since any organization or special interest group can submit a petition for an Indiana license plate design, the trucking industry in Indiana is hopping on the license plate bandwagon with their own request for a trucking license plate. Officially called the Indiana Trucker License Plate, the Indiana Motor Truck Association, known as the IMTA, is asking Indiana residents in the trucking industry to sign the petition for the special license plate honoring Indiana's vital role in the American trucking industry. 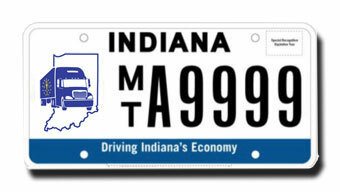 Check out the Indiana Trucker License Plate page on IMTA's website. Yep, you read correctly. This is the winning license plate design that could be gracing the passenger vehicles of any Hoosier that wants to promote a trucking career. 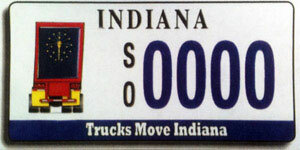 If you look at the plate closely, it appears to be a view of the back of a trailer with a portion of the Indiana state flag imposed on the trailer doors. Is the back end of a trailer what people envision when someone says "I'm a truck driver." I don't think so. Where's the tractor? Where's the part of the truck where one would find the actual truck driver. Isn't the truck driver the most important piece of this puzzle? I think by glorifying the rear of the trailer, the IMTA has shifted the focus off the truck driver. And truck drivers are the very people who would buy this license plate! Which design do you like better? Let's tell the IMTA we want the truck, not the trailer! Leave your comment on our blog below!